Last night my husband was describing to me the best photograph he had ever taken – a monarch butterfly perched on a dewdrop on a flower. He said that he loved that photo, because it was the most beautiful thing he had ever created. He lost track of that picture years ago, and he wondered if some day he might find it again, just by accident. “I wonder where it could be?” he asked. “It’s with the Frank Sinatra record,” I said. He didn’t know what I meant. But everyone has a place like that. In 1941, Lake Compounce in Bristol Connecticut (my hometown) was THE place to go for great music. An old amusement park with a fabulous ballroom, all the big bands came to Lake Compounce. And one event in 1941 packed the ballroom. It was Tommy Dorsey and his orchestra. My mother, not quite eighteen, was one of the teenagers that came to dance to Tommy Dorsey’s band. And to listen to the handsome young man who sang with the orchestra – Frank Sinatra. “He was wonderful,” she still says many many years later, in exactly the same voice I use when I talk about James Taylor. After the show, my mother and her girlfriends waited for their ride. The park emptied out. Some of the band members hanging around came to talk to these pretty girls. 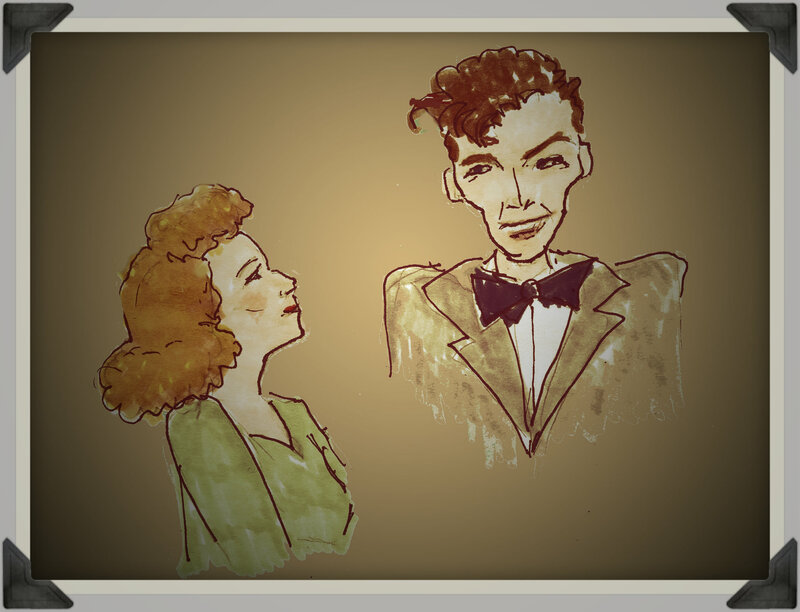 And that’s how my mother met Frank Sinatra. And Frank Sinatra bought her a hot dog. AND – he gave her an autographed record! No one but my mother has ever seen this record. All the while we were growing up, my mother told this story, and told us she still had that record…somewhere. But as the years went by, our doubt grew. “You made that up,” we accused. “Sure, Sure,” we kids said. And exasperated, she promised us that someday she would find that record, and PROVE it to us. we knew where it was. Lovely story, basis for a movie, I think. I wonder how much the hot dog was?? I have a lot of single socks with that record! Wonderful, and very well-timed. Now I have something to say to the friend I borrowed the ski gloves from, when he asks where the other one is. I agree with Diane…You must write the screenplay! I love hearing other family’s inside sayings. “The Lost Place” ~ what a haunting idea! Incredible…what a sweet story. I agree with Diane and Libby Lu…movie! I believe your Mom also (I know, I know, cousins rebellion, but she use to be my pecan sandie connection, how can I doubt her). I heard about that concert all through my growing up years also, Mom and Phyllis were there, but they never got a record or a hot dog – that I heard about! Pecan Sandies! My father’s favorite cookie right up until he passed away, my mother was still bringing a little bag of pecan sandies to the nursing home. Mom would never bought them – When we would go swimming up to Rockwell Park, you mother always brought a bag of them for us to have. She got me hooked. Everytimie I see a bag, I think of her. Wonderful post. I hope someday your Mom finds that record! Nice post. Fun to read. Hope someday she finds the record. That would be quite a dish of crow for her family members to eat! This is a truly lovely story. Thanks for sharing it. Beautiful story. Someday, you or she will find that record. It’s there, somewhere. And in all of your hearts. Oh, I love it… a family tradition from a mysterious lost Frank Sinatra record! I found myself hoping the record would turn up by the end of your post. That record is going to turn up one day, and you are going to have to eat a lot of crow! Speaking of lost socks for a second, I recall mentioning SOMEwhere in the blogosphere that I used to lose sock too. But I don’t anymore since I got my new washer and dryer when I moved three+ years ago. Maybe we could look for lost things in there. Might that be the reason it’s not hungry for single socks anymore? Love that you mom met Frank Sinatra. Wow. And the Tom Dorsey band boys and got a hotdog. Geez, that story has GOT to be true. I have come to the point in my life where I do not declare something lost until I stop looking for it, until then I just don’t know where it is. That’s a nice philosophy… I think I will apply it to more than “lost stuff”. I will add my voice to saying this is screenplay worthy! Go for it! In our house the reply to “where is…?” was “Mom put it in a safe place.” My mother had a tendency to hide things in a safe place. The reality is, a common street thug could probably locate all of the valuables in the house within 2 minutes… Mom would not be able to remember where her latest “safe place” was for years, and then only by accident when she was looking for something else. Fantastic story! You had me at hello. Or more like you had me at “It’s with the Frank Sinatra record.” I love your artwork too. You nailed it. Frank Sinatra records are better off lost, anyway. But I do hope he finds that photograph! I love it. May hafta use it even. Thanks for a better answer.